← Play Taiko with Soh Daiko! Register Now. 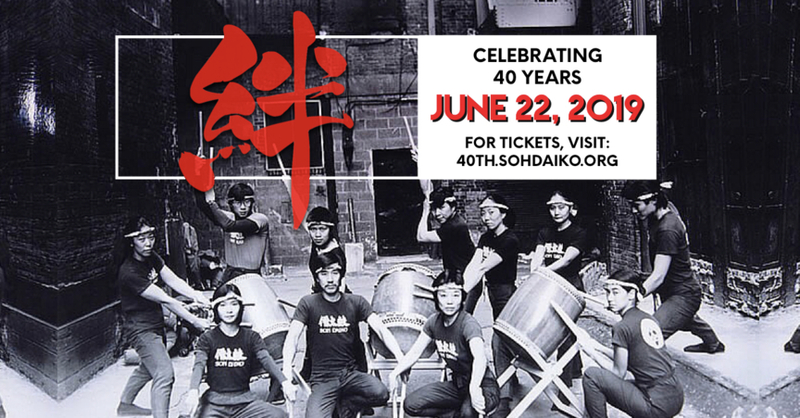 On behalf of everyone in Soh Daiko, a sincere “Thank you!” goes out to all of those who have supported us this month. Among our core beliefs is a desire for fellowship and oneness among our members, and it is our mission to ensure this unity radiates into our community. Together, we raised $140 in support of the Audre Lorde Project; it means soh much to us to know that others share in our goals. Thank you, again! We’ve had a busy start to the summer! This past weekend, Soh Daiko members spent their Saturday in the dojo hosting a public taiko workshop for members of our local community. On Sunday, we took our drums on the road – literally – to march in the New York City Pride Parade along with members of the New York Buddhist Church. 15 people joined us on Saturday from as far away as Hartford, CT. We reviewed a brief history of taiko and an explanation of the various types of instruments we employ in our performance, followed by a vigorous group warm-up. Participants learned about basic striking in both beta and naname stances, coupled with exercises to help them continue practicing on their own – we’ll be seeing you all at recruitment, right?! As a culmination of the day’s lessons, participants learned the piece “Renshuu”, a common practice piece among taiko groups, as well as some basic pointers in how to play a piece as a part of a group. In all of our workshops, we emphasize the importance of kiai, or using various “shout-outs” to support one another as we play together. At the end of the workshop, participants were given the opportunity to play for one another, kiai-ing, jamming, and generally reveling what it means to play kumi daiko. Thank you, everyone or joining us and sharing our love for taiko! On Sunday, we were grateful to have the opportunity to join the New York Buddhist Church, marching with a record-setting 40,000 people down a two-mile stretch of midtown Manhattan. It was a beautiful, sun-filled day of friendship, music, and PRIDE! Thank you to all of the organizers, participants, and the thousands of community members who come together each year to make this day possible.